This is a place I first found via Chowhound in a discussion of the best burgers. Being that it was new at the time and so close to my then new home in Port Chester, I had to go try it. So one day after work off we went. The menu is an al a carte menu. You have to order your patty size, and then any topping you want on it. And for the record, ketchup is not on the menu. This first visit lead me to order what I thought I wanted instead of what they do best. I ordered a single with Swiss cheese, mushrooms and sauteed onions. Well as I then wrote on another website, it was very good just not great. I soon learned this was a function of ordering the wrong item. On our second visit the owner Kory made mention of my online review and wanted to know what I thought would make it great. We talked for a few minutes and he suggested I try just the burger this time without everything else on it or at a maximum just one item added. So following his advice I went ahead and ordered a single with just the sauteed onions. I don't know if I ever told you this Kory, but that burger was great. It is how I order my burger every time since. Default cooking is medium rare here. For the longest time other ways was not even an option. And taking my experience into account I definitely believe this is a case of where you should let the experts do their thing their way. But the burger isn't the only star of this show. They serve an excellent large cut french fry that is amazing. We will typically share a small order of the fries with our single burgers. They also have excellent brownies here. I highly recommend you try one. Lastly is your drink. We have been known many times to stop in on our way out of town to pick up a shake each for the trip. 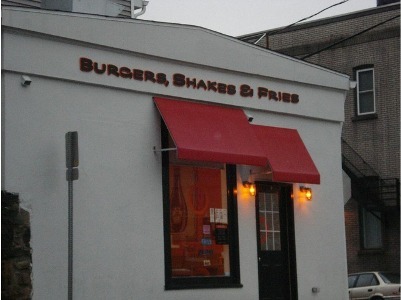 Simply put, we love their shakes. The vanilla is by far my favorite and is also the base to all of their shakes. 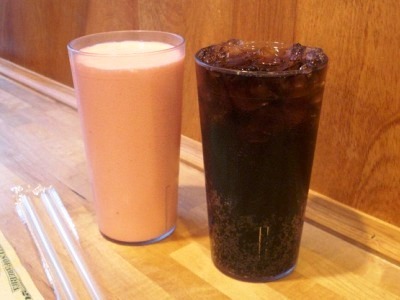 You can choose from the Vanilla, Strawberry and Chocolate or you can go with one of specialty shakes. My wife loves the Cinnamon shake. It sounds pretty bad to me, but I know it is a lot better. Looks great! 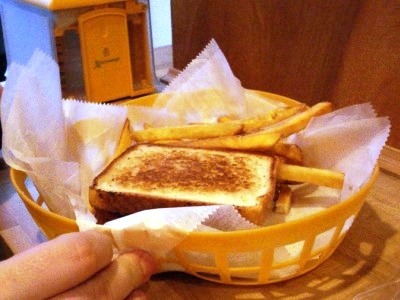 They seem to be a little "Louis Lunch"-esque... toast instead of buns and no ketchup. Downtown Pizza - Portsmouth Gas Light Co.